In hindsight, I have no clue how I made dinner yesterday lol...it's kind of a blur. I was in so much pain that I didn't think I could even peel a carrot. 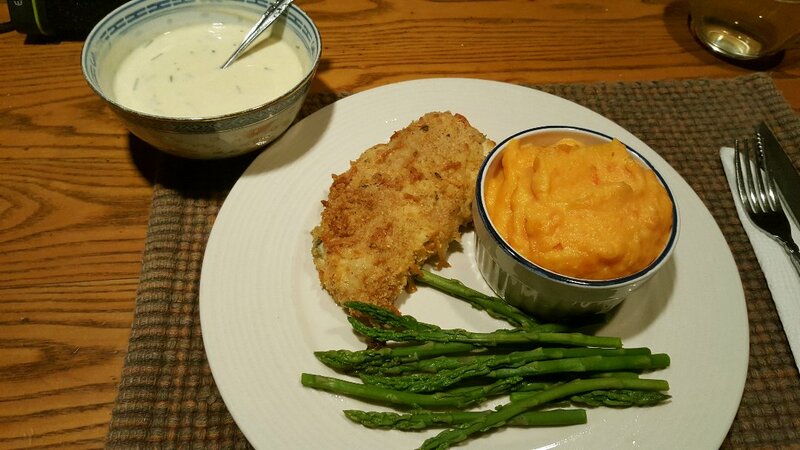 But I somehow found a way to make Oven-Fried Chicken Basil with mashed carrots and our leftover asparagus (I still have enough for another dinner!! )...I love that asparagus is in season and it's so inexpensive! 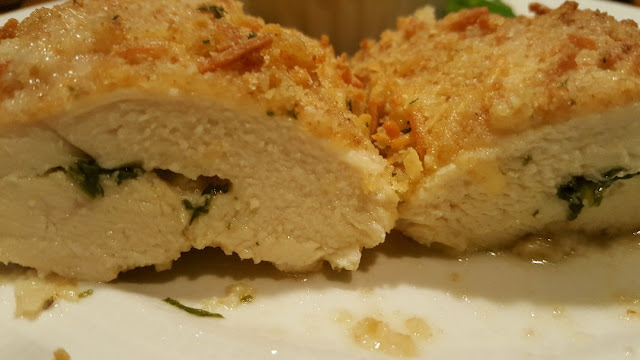 Whenever I make a stuffed chicken breast, I always feel the herbs get lost in the flavour, but this time, the basil was so fresh! It was so delicious. I whipped up a yogurt/Dijon/chive dipping sauce, but it was just so-so. Plus the chicken didn't need a dipper at all! Speaking of silly...Charlie now wants to be fed from a "human" plate. Her requirement "du jour". Two hours later... That tiny little spot I surrounded by rocks took me that long to clean up! 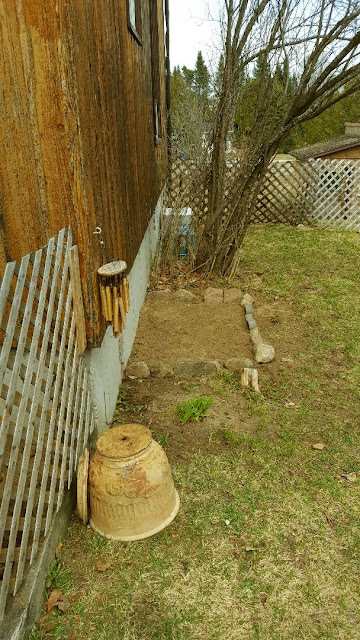 This might be the spot for my Moon Garden. I have to think about all of this! Behind the lilac tree you can see some blue and white bins. That's where I'll be putting some container veggies, right under my "window" garden. This side of the house gets all the sun. I would have made the little garden bed longer, but there is a tree stump just at the closest right corner in the photo, no uprooting that monster! Yesterday I mentioned that I wanted to wait a little bit to transplant a bed of wild lilies. I didn't wait, I decided to do that today, it was t-shirt weather so I wanted to take advantage of that!! But little did I know I was in for another 2 hours of work in this tiny space. My friends...the roots around here are outrageous! And they lead to NOWHERE...it's crazy. At least this is now weed and root free, my gosh, I'm sure my hands will be feeling this tonight. All the beds are now covered with cardboard (thanks Nik!) and will wait for 3 weeks or so before I start adding seeds. The wild lilies are now on the side of the house next to the walkway I did yesterday. Look at that worm! I came across some really nice worms today. Alex wants to make a worm farm one of these days for our fishing ventures. We certainly have plenty of worms to start with! Thanks so much to everyone for yesterday's suggestions! I ordered this today and hopefully I'll get this by the end of the week. I'll let you all know how it works. I love this company, Vogel, I order lots of tinctures from them, so I know they have good quality and organic products. Now I better get up and start dinner prep before I wilt again! I hope the arnica cream will help u.
I like to make my own salves and creames but I am always happy to find a good replacement. The amount of flowers or plant or roots u need to make your own is often the killer. Your little garden bed loks great. 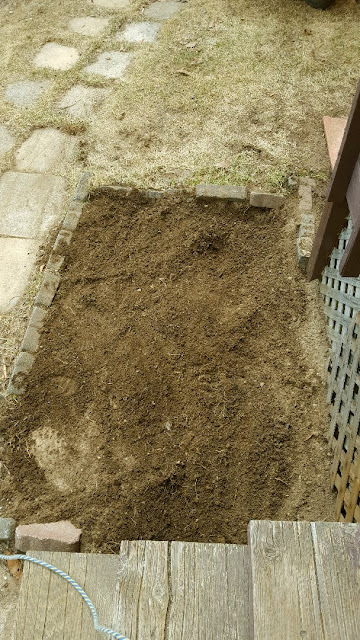 Maybe it woukd have been easier to build the bed up and fill it with soil instead of digging up te roots. 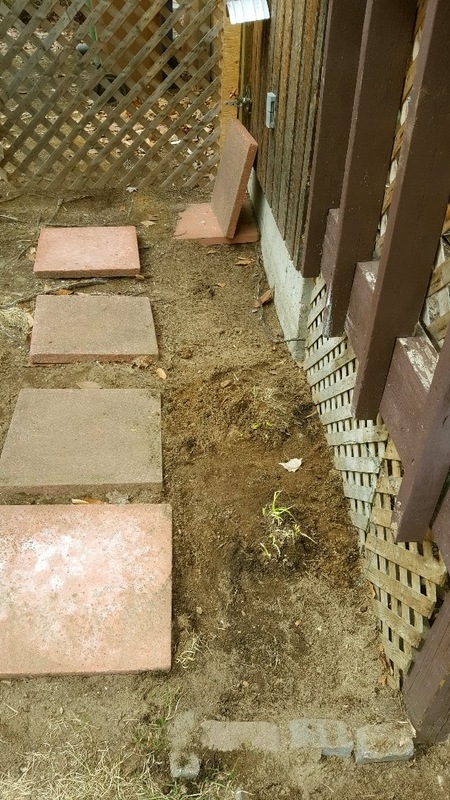 Easier on your hands ... get rid of the weeds lay cardboard down ... build some kind of wall ... with rocks or boards and fill it up with manure and soil ... maybe for areas where u would like to plant but cant get rid of the roots. It would work for herbs ir lettuce or vaggies ... just not anything that roots deep into the ground. Your chicken looks yummy !!! It will take a few days to get the garden muscles in shape, just another benefit of a garden. I am growing Roma tomatoes, they are good to cook with. you are my seed soul sister! too bad we don't live closer so i could give you like 400 plants! Roots are quite a bother. We have had just a few (oak roots, to be sure) but the amount of time working in and around them can be frustrating. I have just conceded the bulk of where they are and moved on to other areas. 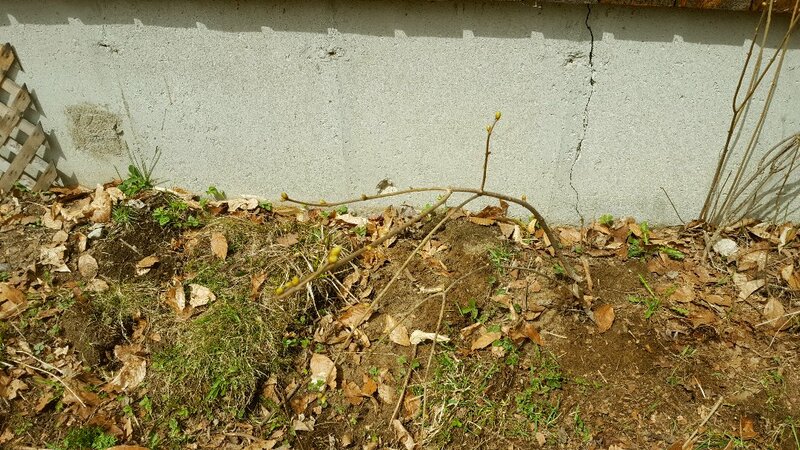 You are really getting a jump start on the gardening season by getting all of your areas ready way ahead of time. (Wish I was doing as well but we're having a BAD weather week. Ice, snow, rain, wind, nasty, nasty, nasty!) Gotta admire your dedication to keep going even with the pain in your hands. Let's hope all the work you've been doing loosens something up and the pain will go away. 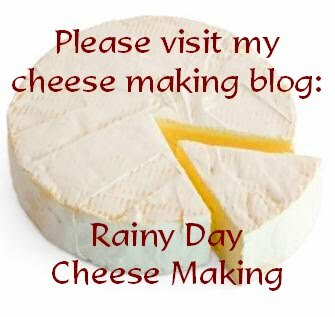 Maybe with the help of the arnica cream! Those seeds you found in the basement from last summer should be just fine if they were stored in a dry, cool place. I have actually had success using seeds that are 7-8 years old. The fact that you're finding lots of worms in your soil is an indication of good soil. Hooray! I hope that cream gives you relief. I find that the comfrey salve I rub on helps for joint pain too. Thanks Nik :) I hope the arnica helps too. 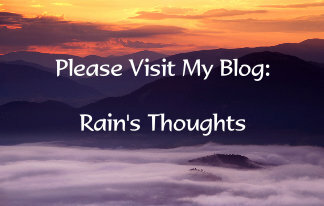 I'm feeling it really bad today because of the damp weather. The reason I chose not to build the raised beds is because of the last car expense, I'm out of money basically! So I have to make do with what I have and my own creativity! I'm just glad it's done! The next big task will be digging up an area for the pumpkin patch. I'm still going to use containers in most places, I just don't want all the weedy rooty mess around my garden. But we're going out next week, if we can find some soil on sale, I might do the raised beds after all. We'll have to see! Hi Joyce, seed soul sister, lol! :)) I would LOVE to get 400 plants! Hi TB :) I'm trying to do the same. If there are too many roots, I don't plant there or work around them, but some of these roots just lead to nothing. They are planted deep into the ground, but when I pull them up, they're not attached to anything. The previous tenant cut down a LOT of the trees on the property...without the owner's permission, because he got fired from his job and lost his electricity for not paying. He was using the wood he chopped to heat the house, green wood too...so he left a lot of damage here. I don't intend to clean it all up, but I'm trying to make some areas look a little less trashy. Hi Mama Pea :)) I'm really glad we're not experiencing your weather, that would be discouraging. I really need to take advantage of the warmer weather to do stuff like that because I don't want to get overwhelmed when end of May gets here and I have too much to do! That's kind of when anxiety can overtake me and I risk not doing anything to avoid the stress. 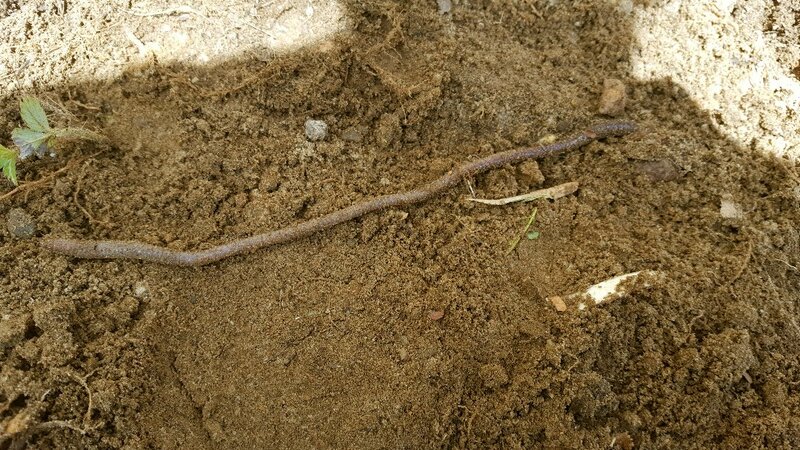 I never thought about the worm/good soil connection! I guess we do have good soil because really, there are lots of worms! Happy to know that!!! 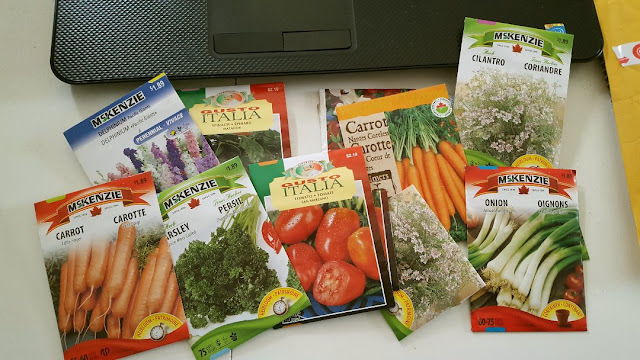 And the seeds, it felt like Christmas finding them, I'd completely forgotten about buying them...they were in the cool basement so I hope they grow! I'm going to wait to plant any more seeds now though, after seeing my peat pot seedlings (seemingly) kicking the bucket. Thanks Kristina :) I hope the arnica helps too, they haven't shipped it yet, I hope they get it going today, I want it before the weekend!! 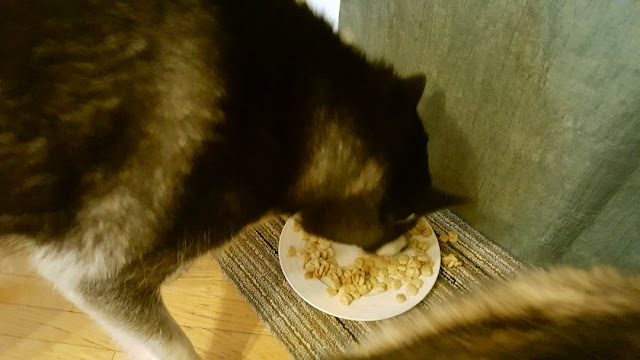 Lol Susan, they may have been separated at birth...I swear Charlie has some issue or the other EVERY day...today I had to put a little of her kibble on the floor SURROUNDING the plate and then she thought it looked delicious and ate the whole thing. Last night I made a hole in the middle and she loved it...I think she likes to play with her food! The garden is a lot of work but I am thrilled about it. It's hard but it's also therapeutic for me at the same time. Winters are so long here and being outside finally really lifts my spirits. And I'm pretty proud of myself for getting all that done too! Oh how jealous am I that you are in your yard working away!! We have been so cold that I don't even want to walk around and take inventory :) You are a machine, just look at the hard work that you've done! I hope your hands have recovered from the shock and feel better. That chicken looks delicious! I have a hard time with anything breaded, I am just not a fan. I think because when growing up - everything was breaded. Too much maybe? I had a cabbage roll stir fry on the menu for tonight but a change of plans! I have to be out of the house for 5 p.m. so I think we will have pizza. I will table the stir fry for another night! I just love asparagus. My parents grew it for many, many years. Such a treat in the spring. Hi Dianna :) I think I"m the say way with rhubarb, I had it way too much growing up and I can't even smell it now without feeling kind of sick to my stomach! I'm still trying to perfect the "oven fry" method! Not quite there yet, but I'm close!!! I feel like a scientist! And thanks...today the machine is stalling lol...I'm so tired. The rainy day came at a good time! I made Charlie's food look like a donut last night...tonight I'll try a triangle lol!